Suminagashi Ink is a type of Japanese hydrophobic ink used in calligraphy and for book binding. This special kind of ink floats on the surface of water and creates interesting patterns when mixed with other inks and stirred. Using this simple technique you can create beautiful, one-of-a-kind ink prints by dipping paper onto the ink on the water. Fill the bottom of the cookie tray with one inch of water and place on a flat surface — allow water to settle before proceeding with step 2. Carefully drip ink onto surface of the water. Ink is hydrophobic and will mostly rest on the surface of the water. Pro Tip 1: Instead of dripping directly from the bottle, use plastic pipettes to drip ink onto the water with more accuracy. There are many different ways to transfer the ink to the water’s surface. 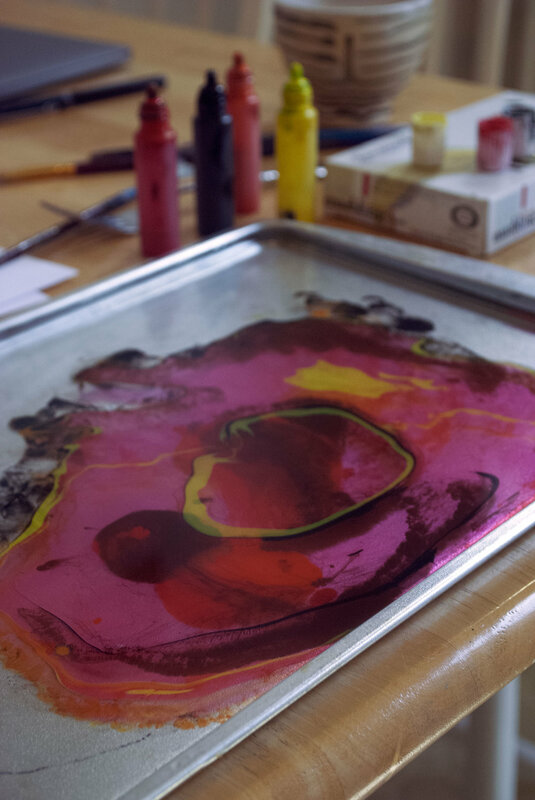 Continue dripping ink in the tray until you’ve used several drops of each color you want. The ink will push outwards in spherical patterns and should cover most of the pan after several drips. Use a stir stick to mix the ink around gently creating new swirling patterns and designs. 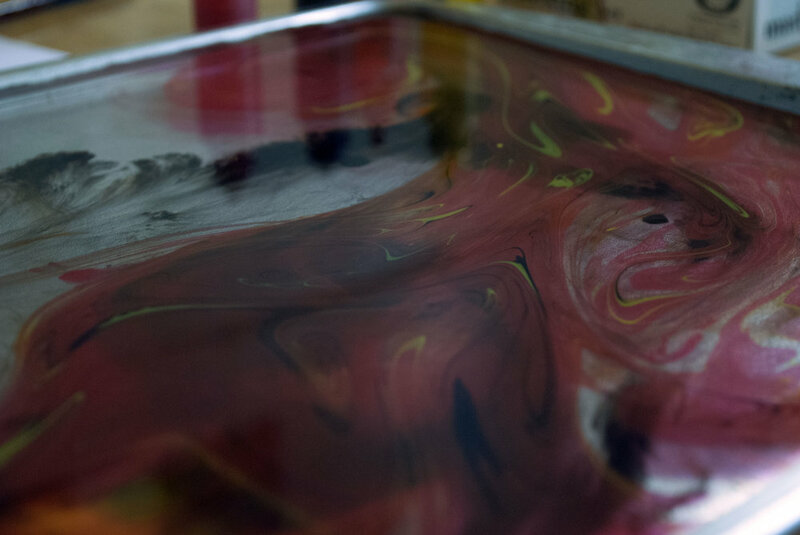 Alternative: simply blow on the surface of the water to mix the inks into similar swirls. Once ink is mixed to your liking, take your paper and lay it flat on the surface of the water. Allow it to set for a moment to allow the ink to properly adhere. Pick up your paper and rinse under running tap water to wash off any additional ink that may still be on the paper’s surface. Leaving the ink at this point will have your print looking murky or smokey. Pro Tip 2: Depending on how much ink you used, you might be able to make one or two additional prints from the remaining ink in the cookie tray. Don’t waste ink! Step 7: Set your print out on a flat surface to dry. Feast your eyes on the super psychedelic marbled prints you just made! Be proud of yourself and your accomplishments! And go clean up the huge mess you inevitably made! ***FYI The inks I used for this demonstration were rather old and did not float on the water’s surface as neatly as they should. If you try this project yourself, your inks should spread out in much nicer patterns than those shown here! Good luck!